ROAD TOWN, Tortola, VI – The Commonwealth Observer Mission here for the 2015 national elections have made a number of findings related to issues of campaign financing, the caustic nature of the political campaign and the perception of ballot tampering as a result of the failure by some Returning Officers to follow correct procedures. 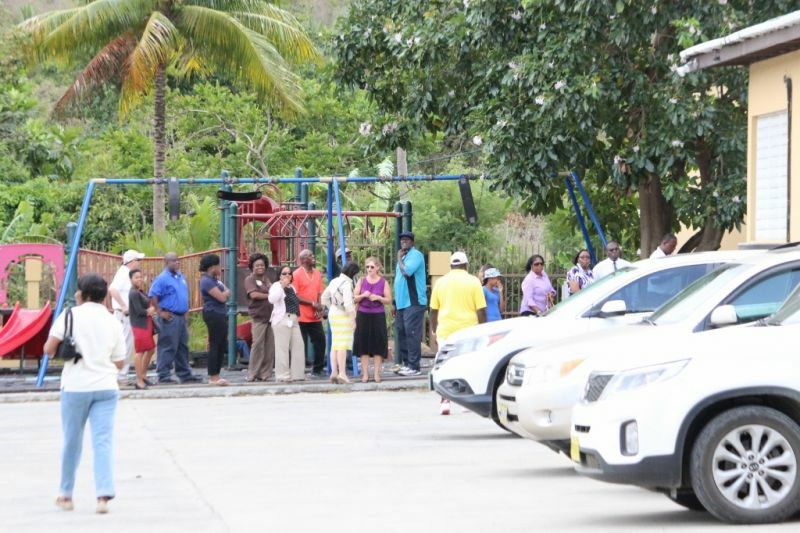 Here since May 30, 2015, the team had observed all nine polling stations for the June 5, 2015 advance polling and had made repeated visits to 21 polling stations across the territory on Monday June 8, 2015 and observed district and territorial counting and the results tabulation process. The team released a preliminary report of their findings today June 10, 2015 but will at the end of August 2015 present a much more detailed final report in which a number of recommendations matching the findings will be made. “In answer to your question we are reluctant to outline our recommendations at this stage partly because the election process may not be complete. There may be ongoing issues that may need to be continued which can be related to complaints or petitions yet to be filed so we would wait for the further two months to make those recommendations,” said Matthew N. Salik, one of the experts on the observer mission. “But if you read the [preliminary] report, you could infer from it what sort of recommendations we will make,” he added. 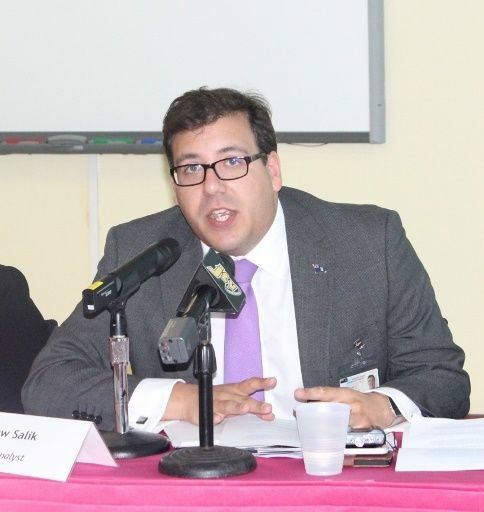 The IOM’s preliminary report said that while the campaign was peaceful and vibrant and saw high levels of public engagement and the preservation of fundamental freedoms, the majority of persons members of the mission met described this campaign as the most negative they had ever witnessed. “This consisted of personal attacks and accusations, criticism and allegations of past performance of opponents and inflammatory and defamatory rhetoric, rather than positive discussion of the major political issues,” the report said. It said too that the observers noted a heightened divisiveness of the campaign, both for society at large and within families. 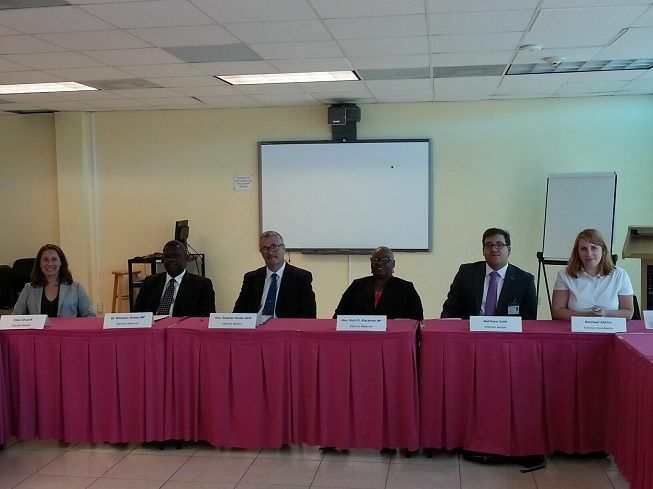 The report said that on the day of advance polling on Friday June 5, 2015, the mission was notified that the closing process in relation to placing and sealing ballots into envelopes was not performed in the majority of polling stations. “Not placing the ballots into separate packets is in breach of Section 49 (1) of the Elections Act. This resulted in reinforcing the perception by some parties of ballot tampering by elections officials,” said the report. “There was a clear failure by some Returning Officers to follow correct procedure. This was compounded by most candidates and agents present failing to identify and raise the erroneous process in a timely manner,” the report said. However the mission does not feel that this compromised the secrecy of the ballot or the polling results as they relate to advance polling. The mission found that on polling day June 8, 2015 the process was found to be comprehensive and accurate but laborious, leading to a slow processing of voters. They said elections staff confirmed that extra polling stations and distribution of two ballots contributed significantly and positively to a less time consuming process. The mission said that the legal framework lacks regulation on campaign financing both for donations and spending. The EOM was told repeatedly that parties or candidates were receiving large donations from business entities, underlining the need for greater transparency in campaign financing,” the mission said. The mission said they were inconsistencies regarding the photo ID requested but not requested of voters upon arrival. Most voters brought their ID and offered it before being asked, demonstrating the effectiveness of the voter education and voters’ awareness on this matter. Voters were also asked to confirm their name before or after producing the ID card,” the mission said, adding that very rarely were voters asked to verify their address and occupation as outlined by law. Both the district and territorial counts observed by the mission were transparent and well-administered, despite the length of procedures to read out each name and show each ballot to all present. “A positive aspect of this process is that it leaves little room for error, and in the case of a close result, precludes any reason for a recount due to the clarity and decisiveness of everyone seeing each ballot,” the mission said. However, it said that the decision to wait for all territorial boxes to be transferred to the central counting venue led to an unnecessary delay in the start of the count, beginning at 11:00 PM and finishing the following afternoon. The IOB "Preliminary Report" is rather interesting. As stated, it is preliminary; as such, the meat and potatoes are still to come. It is also clear that the biggie in the final report is going to be under: CAMPAIGN FINANCING. "The mission said that the legal framework lacks regulation on campaign financing both for donations and spending. That is exactly the area under which the campaign was won, (or bought). They will have much to say regarding this. Any bets? up the majority of broadcast and advertising time from the media. In the USA, Campaign financing and spending is regulated by law. Even left over funds after the elections must be accounted for, and cannot simply be handed out to supporters and campaign committee members. 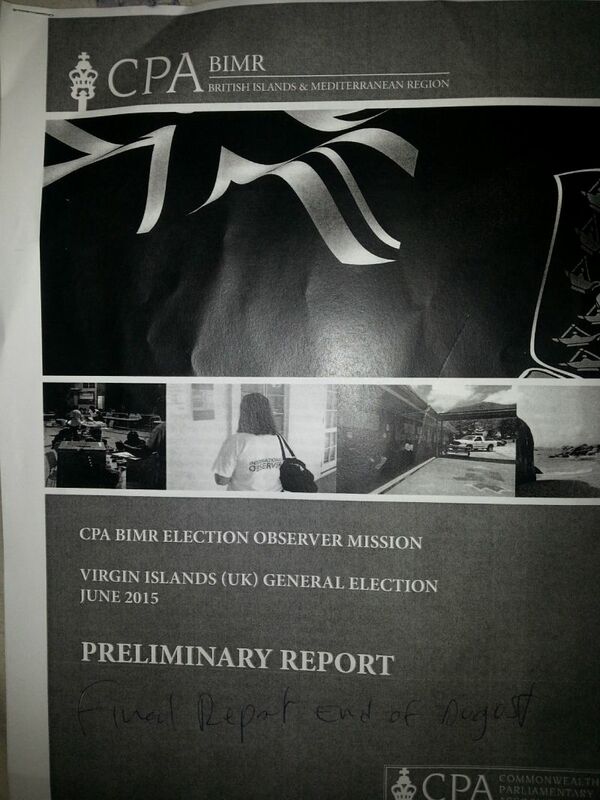 This is the most undemocratic aspect of campaigns in the BVIs. This must change or we would loose what ever little Democracy we do have. When others, including our investors choose to make huge Donations to one party and nothing to the other party or parties, (instead of making meaningful contributions to our Health Service, our Education Department and Infrastructure), it is unhealthy for our Democracy, and actually stands to Destabilise our Democracy. Another area the Observers will be commenting on is the area of contracts and projects being signed and started on the eve of elections. Democracy is about fairness, and like a case in court in which the jurors must be allowed to hear the evidence on both sides of the case before a verdict is handed down, so to the electorate needs ample time to hear all sides from the contesting parties, in order to make an informed decision. That surely was not th case in this recent election. The old folks used to say there is book-sense and common-sense. However, today, it is evident that there is a lack of both in the BVI. We therefore need to lay the blame on the educational system (pre-primary to tertiary) as well as the way that people are trained at home, in the community, and religious institutions. You sound just like my bitter co-worker from east end. A few days before the election someone told me that he had received over $1000 from two of the elected party members and that he was awaiting another large sum that very day from another elected official. (The Devil put them in...but God will take them out!) The UK need to come down here and set things right, the greed of this nation is unbelievable. (Contracts and projects being signed and started on the eve of elections) Ask JVD residence how many of them received promises of contracts and projects the day before the election by the good Minister. Politics is his true calling! They continued by saying "However the mission does not feel that this compromised the secrecy of the ballot or the polling results as they relate to advance polling.". dates, a notable number of voters would have been unable to vote at this election. So we back to square 1. Isnt obeah a crime in the Virgin Islands???? This is a knock-out----No issue with who the winner is---No need to make an Issue of the results.-- VIP Ignored the street reporter reporting from the street--therefore ignore the people of the streets.----The streets are saying Ronnie need to step down for many reasons 1/ lost Control of the board and Health--2/ his own health--3/ time to turn health over to a doctor, there are 3 doctors--Put Pickering in health and put Marlon in Pickering Spot---Reporting from the street. @uk student; the governor of this territory will be swearing in the NDP Ministers today( who gives a !uck what you recognise) are you a real student ? @wize up Oh for peace sake. This entire thing is shameful. And I don't care how many of you hit "dislike" at this, but open your eyes and stop pretending as if the NDP government won this election fair and square. They did not. Money contained in envelopes were handed out - I know this as fact. Promises were made to people who only care about self and not about country - those few who wants little $5,000 contracts just to line their feeble pockets, and care nothing about the nation of people as a whole. I know of persons who promises were made to. You all just stop it. VIP supporters - don't mind the talk, don't mind the noise - sit back, eat your popcorn and watch what takes place for my GOD DON'T SLEEP! ...and someone told me they got over $2000 for their vote. Greed! Only 6.52 percent of the total registered even voted? Shame on you all. You have no excuse and can't complain. If you are not part of the solution, you are part of the problem. A democracy is based on total participation. No wonder a party thinks they can get away with things because no one is paying attention!! you get what you deserve. 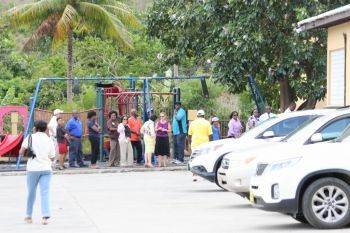 BVi has one of the highest voter turns out worldwide, more like 80%, some 10,000 votes cast across the districts, you're quoting a % that bears no resemblance to voter turnout! I'm a VIP supporter I'm satisfied with the results. The thing is even if u support a party u should not vote all the way if u want to have a balance HOA. Voting all the way is a fallacy and rhetoric it does not give u a balance HOA one way or the other. Our ppl needs to be educated about this type of voting. U r creating a monster when u have a one sided parliament. We should start thinking of e-voting as done in Europe. A lot of Obeah went into this election and many persons know this! What is done in darkness will come to light. This comment will receive a lot of negative response(s) but I don't care one bit. God is a God of love but also a God of wrath. He doesn't sleep nor slumber! Everyday Obeah is at work on every side of the fence; so what's your point! You call it Obeah. I was trying to find an answer to the crazy ritual that I heard one night in the Josiahs Bay area. It wasnt just the sounds, there was some crazy things happening on the hill. Of course a lot of OBEAH was in this election especially in the six district. Headless goat moving around on campus, but God sent them back in office for a reason sooner or later we will see the NDP will not reign their four years in office. God's power is stronger than any other power. Glad that the mission was able to observe the behavior of the people who said they are going to serve the people of this territory. Only if they hear them in the HOS.they will be appalled. Some are there just for the power and the money. They behave like dictators. We talk about Countries being ruled by dictators but we are no different now. They even try to muscle the media. The leader of the party allow members of his group to redicule and insult the leader of the VIP.that in itself does not show leadership. No time in the campaign did they tell us how they intend to build the territory.they only bashed the other side.that was rude and vulgar.no respect. When the VIP won 11-2 I didn't hear the noise about Obeah, although it existed but now the other side won 11-2 it's Obeah. The world is round. What goes around comes back around. It's because they tried to kill out the BVI Fishing Industry, as all the News Reports stated that election year! Yes!! Girl, preach. They really don't get it. Yea its nice they in but some of you all will cry soon trust me with that .i will want that vip in bvi going under now trust me with that. Ill keep it simple, the ballots were not placed in sealed envelopes as mandated, but they also were not removed from the locked and sealed ballot boxes untill Monday in the view of the observers, and candidates. So the boxes were still locked and sealed, but people would still say they were tampered with. If they followed the propper propper process, they would have found some way to say that the envelopes were tampered with. Please Note that the election observers didnt not fine any such issue wtih the boxes or the seals that were placed on them, nor did the candidates, the issue was putting them in the envelopes. Lets read and understand properly please.